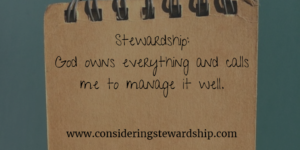 Depending on where you are from, stewardship either means taking care of the earth or the campaign you run to build a new church building. Stewardship is the management of resources that do not belong to you. Financial managers, people who have power of attorney, even employees are all tasked with managing things that they don’t own. Christians understand, we are bought with a price and we are not our own. (1 Cor 6:19-220) Christ purchased us with is own blood and he has blessed us with the ability to gain wealth. Wealth that is not our own, but his and we should use it to honor him. Just missing it: There are people who don’t realize that being a Christian affects all areas of you life, including your wallet and how you handle money. Maybe they just haven’t read the Bible and their church doesn’t teach it because they may offend people. Either way they just aren’t aware that the Bible calls you to be a steward of God’s resources. It’s my money: Yes, you work hard for your money. You spend time away from your family and sacrifice for your money. But you are only a steward of what God has entrusted to you. He has given you the ability to gain wealth (Deut 8:18). He has put you in the place to be where you are. Think of all the things that were outside of your control, but in God’s, to get you where you are. The Government is not Charity: Voting for money to be taken from one group and given to another is not charity it is theft. God called us to give, and care for the poor. He didn’t call us to force someone to do it. Render unto Caesar what is Caeser’s is a call to obedience but not an excuse to not give and steward your money properly. Lack of skills: You just weren’t taught about money and how it works. You don’t know how to properly plan for your money and create a budget. Stick around here and I will help you with that. Check out our self paced budget course. Stewardship is a call to all of us, to be wise with our money and sacrifice “more” so others do not have to do without. Apart from all the political excuses, it is a shame that we have large expensive buildings and homes while people go hungry.